Saturation theory is concerned with the following two problems: 1) To establish so-called saturation theorems for certain approximation processes; 2) to give simple characterizations of the corresponding saturation class. As in  we treat approximation processes generated by singular integrals of Fourier convolution type of functions f(x)∈L p (E n ), 1 ≦ p < ∞, where E n is the Euclidean n-space of vectors x = (x 1, ...,x n ) with the usual metric and inner product. 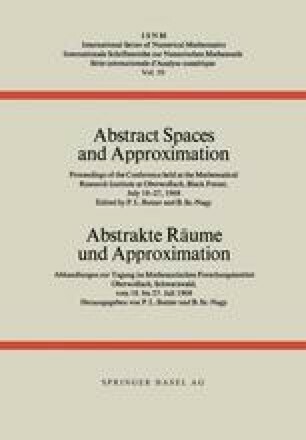 In  special emphasis has been given to the characterization problem (problem 1) in the n-dimensional case, and the method to obtain saturation theorems has only been explained via one example, namely the generalized singular integral of Weierstrass. (See Theorem 1. 2 below.) The aim of the present note*) is to treat saturation theorems (problem 2) of general singular integrals in a unified way. Here we use elementary distributional methods (d.-methods) to the same extent as in  in order to provide a complete and rigorous treatment in the spaces L p (E n ),p > 2.